‘Tis the season. Spring tornadoes are nearly over, and hurricane season is upon us. It’s easy to blow off (sorry) the idea of survival kits, preparedness and so forth — especially if you’re a young person or immigrant from northern climes who has never experienced a big storm. Mistake. Ask anyone along the Gulf or Southeastern US coasts. The Boy Scouts have it right: Be Prepared. You folks living inland have nothing to feel smug about, either. Ask anyone along the Mississippi and its tributaries. Ask anyone in Northeastern Japan, Kansas, Missouri and points east. Ask yourself, once you have your head out of the sand and the sand out of your head. 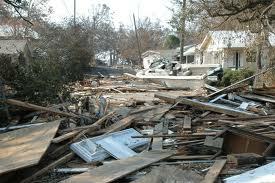 Read the disaster preparedness pages of the CDC. You’ll still probably not do anything, but it will give you something to feel guilty about. Hopefully now, not later. This entry was posted in Family, Florida -- General, Hurricanes, Safety, Weather and tagged Climate, Emergency management, emergency preparedness, Family, Florida -- General, Hurricanes, Kids, Safety, Survival kit, The Other Florida, Weather on May 22, 2011 by Bill.